CLOCK MAKERS Clock Plans Gallery. Please Note that parts on this page are only available by internet order - We will provide telephone or e-mail advice to clock makers but we cannot entertain visitors. Each of the Clock Plans illustrated on this page is accompanied by a list of compatible Movement, Dial and Pendulum Sets. The level of skill required to build a clock cabinet will vary according to the complexity of the design and you may need to make adjustments to some plan dimensions in order to fit the selected movement and dial. Building a clock provides great satisfaction and can also provide very therapeutic benefits. You will find the clock plan on the Options and Prices page of the selected Set. When you have chosen a clock design, please click on the link and you will be presented with a Gallery of compatible Movement, Dial and Pendulum sets. Please note that we do not sell plans separately but if you wish to build the clock cabinet prior to purchasing the working parts you can order any of the Kieninger Movement Sets with a deposit, we will then send you the Cabinet Construction Plans together with the corresponding Kieninger movement dimensioned drawing. Finally, Frank will always provide telephone or e-mail support, to assist you when you are installing and commissioning your movement etc. 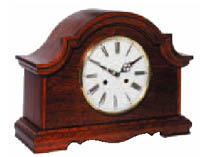 Large Mantel Clock, Height 420mm, Width 305mm, Depth 165mm. (Kieninger movement installation drawing included). Mantle Clock. Height 318mm. Width 420mm. Depth 153mm. (Kieninger movement installation drawing included). Medium Mantel Clock. Height 330mm, Width 254mm, Depth 133mm. (Kieninger movement installation drawing included). Mantle Clock. Height 250mm. Width 270mm. Depth 121mm. (Kieninger movement installation drawing included). Tambour Mantle Clock. Height 272mm. Width 500mm. Depth 120mm. (Kieninger movement installation drawing included). Vienna Wall Clock, Height 914mm, Width 342mm, Depth 144mm. (Kieninger movement installation drawing included). Vienna Lanterndlur Regulator, Height around 1500mm, eminently suitable for the Kieninger RS 116cm movement. Vienna Regulator, Height 1169mm, Width 407mm. Depth 254mm. We also provide a full size drawing that can be used to accurately position and drill the fixing holes for the movement mounting bracket and the gongs. 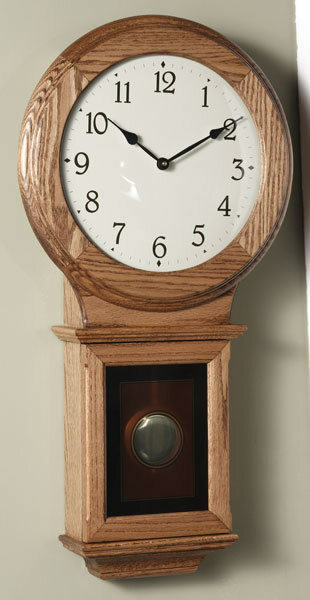 Vienna Wall Clock, Height 1041mm, Width 394mm, Depth 229mm. Additionally, we provide a full size template to ensure the accurate location of the movement mounting bracket. (Kieninger movement installation drawing included). School House Clock. Plan contains dimensional drawings for each wood piece required for assembly. The plan will include specifications for the wood dial ring assembly. The plan package will also include detailed step by step assembly instructions supported with assembly illustrations. (Kieninger movement installation drawing included). Plan 012 -- Grand Daughter Clock. Drawing includes Arched Dial and Square Dial alternatives. Ashby Grand Daughter Clock. Height 1487mm, Width 390mm wide, Depth 228mm. (Kieninger movement installation drawing included). 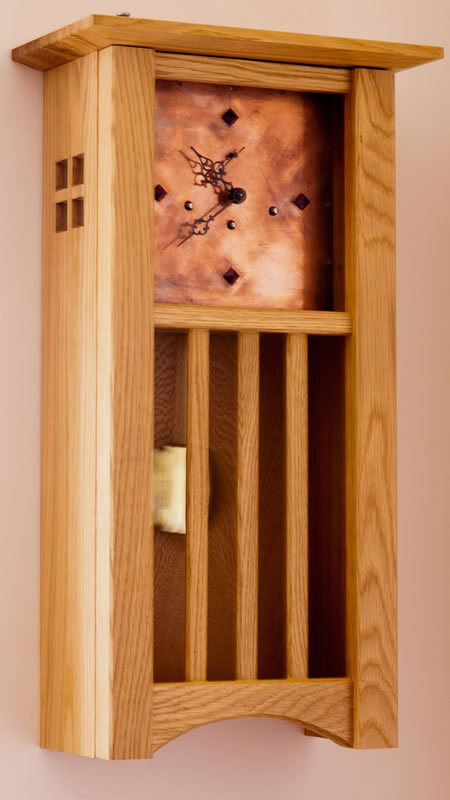 Granddaughter Clock, Height 1524mm, Width 375mm, Depth 216mm. (Kieninger movement installation drawing included). Grandmother Clock. Height 1970mm, Width 450mm, Depth 300mm. (Kieninger movement installation drawing included). 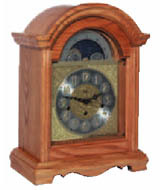 Grandmother Clock, Height 1905mm, Width 444mm, Depth 207mm. (Kieninger movement installation drawing included). The Orleans floor clock evokes the era of 19th century France when the absolutism of the monarchy gave to the rise of the Citizen King, Louis Philippe (1830-48), whose rule saw the nation prosper and the ascendancy of the middle class. In furniture, the most striking elements of the Louis Philippe style are the very clean, simple lines and wide ogee. Feet and brackets terminate in scrolls, and hardware was used sparingly. All these element were incorporated in this timeless design. The "Orleans" model shows a graceful play of straight and curved lines. The crown moulding, which echoes the base, gently swoops toward the centre, with the upper section of the door echoing it, while below, the inside bottom door shape reflects this curve. Height 2134mm, Width 685mm, Depth 330mm. (Kieninger movement installation drawing included). Scandinavian style Floor Clock, Height 1650mm. (Kieninger movement installation drawing included). 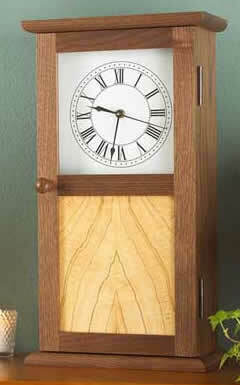 Grandfather Clock, Height 2006mm, Width 560mm, Depth 310mm. (Kieninger movement installation drawing included). FREE (with our Sets) Grandfather Clock plan with a comprehensive Illustrated Construction Guide by Pieter van Vliet. Please contact Frank for details. Clock - Height 2134mm, Width 610mm, Depth 356mm. Set 64 -- HSU, 116cm 01 movement. Combining a collector´s corner cabinet and a full size Grandfather clock. The cabinets eight shelves allow you to display your glassware and collectibles. Build options include the full mirrored back, bevelled glass and shelves and illumination by interior lights mounted in the hood of the clock. (Kieninger movement installation drawing included). Arts and Crafts Grandfather Clock, Height 2058mm. (Kieninger movement installation drawing included). Swedish 18th century Mora Clock, Height 2032mm (excluding the spire), Width 660mm, Depth 330mm. To ensure that the centre of the pendulum bob swings within the lower part of the glazed door you will require a 116cm movement with either a 116cm lyre pendulum or a 116cm temperature compensating pendulum. Very comprehensive set of plans on nineteen 24 " by 36" sheets. The plans include full size patterns that can be traced onto your timber and for producing mdf templates to use with bearing guided routers blades to machine the shaped wood parts. In addition, the plans includes fully dimensioned, construction detail drawings, a twenty A4 page fully illustrated assembly booklet and an eighteen page step by step written assembly instruction guide. The drawing specifies bendable plywood for the curved panels - as an alternative Oakside can supply 6mm flexible MDF panels veneered in real Oak, Walnut and Cherry. We also include a Kieninger movement installation drawing. Colonial Style Grandfather clock Height 1785mm. Dial size 250mm square (Kieninger movement installation drawing included). As drawn the case will stand 1785mm tall; 426mm wide and 276mm deep. Ver simple design can be built with ver basic tools and a router to produce the mouldings. The original was fitted with a battery movement, but we would suggest that this fine case should be fitted with a mechanical movement.